First, excavator plus long arm should select the preferred driving route. 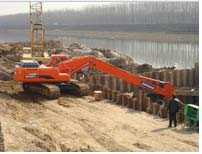 First of all, when using the excavator arm modified excavator, the user should pay attention to choose the driving route. As we all know, the volume of the excavator arm will increase correspondingly after the excavator arm is lengthened. As a result, the excavator will travel more slowly than the original excavator arm without the excavator arm. Therefore, this paper is written in advance. Writing a good route can effectively reduce the midway travel time, only to maintain a good smooth road can be faster to reach the target. Second, it requires drivers to operate excavators and long arms. If you want to dig flexibly with the extended arm of the excavator, you must master the technology of using the extended arm of the excavator. Only in this way can you grasp the character of the long arm and give full play to its advantages for deep excavation. First of all, you must master the strength and choose a good excavation point so as to achieve accurate excavation. And will not cause the bucket to fall. In addition, the compound operation is adopted in the extended arm of the excavator to shorten the working cycle time of the excavator and improve the working efficiency. Then arrange the loading vehicle correctly. Firstly, the number of dump trucks should be equipped with the extended arm of the excavator to match the load-bearing capacity. Because the capacity of the excavator bucket is generally large, more vehicles are needed to carry it, so as to avoid stopping work without vehicle loading in the middle, which will greatly affect the implementation of the work schedule. And the double loading method is better used when loading, so that the excavator is installed between the two cars respectively in a circular arc line, thus greatly improving the working efficiency of the excavator extended arm on the loading vehicle. 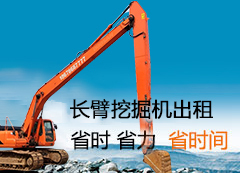 This article is compiled and published by the Extended Arm Excavator. Did you know something about it? For more information, please click: http://www.dybocheng.com. We will have more exciting content for you to see.